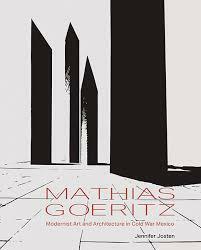 The first major work in English on Mathias Goeritz (1915-1990), this book illuminates the artist's pivotal role within the landscape of twentieth-century modernism. Goeritz became recognized as an abstract sculptor after arriving in Mexico from Germany by way of Spain in 1949. His call to integrate abstract forms into civic and religious architecture, outlined in his "Emotional Architecture" manifesto, had a transformative impact on midcentury Mexican art and design.